Between Oldham and Rochdale, Lancashire, just outside the small town of Middleton. It meets the A627(M) in the middle. Oh easy! This is another "secretive" motorway, where the number does not appear on any signpost, or any map. So have you made it up then? So where is the A6138? It doesn't seem to exist. None of SABRE's lists show it as being anywhere, so perhaps this is the only Ax(M) road where the Ax doesn't exist! It cerainly is. If anyone can shed light on the existence of the A6138, I'd love to hear from them. What do the signs actually say? Every sign refers to this road as part of the A627(M), including the "start of restrictions" signs. This isn't that unusual, as the M10 and M45 were signed as "M1" for many years. Can I see some photographs of the motorway now? Ian Bailey doubts the map evidence! 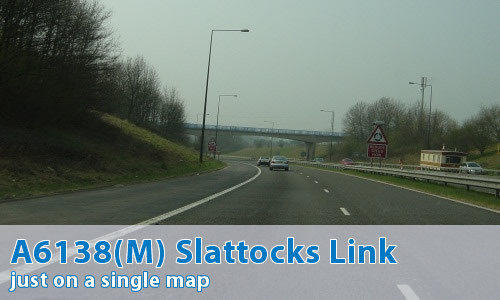 Still laughing at your use of A6138(M) as the number of the Slattocks Link Road. Its a mapping error pure and simple - this is a spur of the A627(M). As you say, there is no A6138, no documented evidence exists officially referring to this spur as the A6138(M), and there's absolutely no evidence on the ground to back the number up. The spur fully deserves its inclusion due to its length, but the number you've used is a bit silly. Phil Reynolds has a thing or two to say about that! Ian Bailey says that the number A6138(M) is a mapping error pure and simple... but I disagree. Someone must have drawn up that map for Esso, and the Slattocks link had been open for five years by then. This is not the A627(M) in the same way that the M10 isn't the M1, and the M181 isn't the M180. OK, nobody's found any official documents referring to it as anything other than A627(M) but nobody knew that the A635(M) was real until a confirmation instrument turned up. If there ever was an A6138, perhaps it was somewhere near here... but then again, there's the A601(M) which is a long way from the A601. All in all, it's quite a conundrum - I'd come down on the side of the Esso map in the absence of any definite contradictory information. In my AA 1998 road atlas, it's there just as a simple spur - it looks green but that's because it's under a page boundary line (yellow). The whole A627(M)/A6138(M) lacks numbered junctions, as do some other motorways, so there are no junction numbers to help us decide here either. I personally think all motorways should have numbered junctions using a distance method of numbering - and the junction at the end of a spur should be the motorway junction number plus "A", just like M1 junction 10A. At least it would make the numbers make some sense." "Some of your correspondents refer to "Mapping Errors". As the AA can confirm, some "errors" are deliberate mistakes introduced to protect copyright. The AA were using Ordnance Survey maps as their source, without permission, and the deliberate errors were transcribed. Result? If I remember correctly, something like £20m paid to OS by the AA."